Need to get somewhere? Nothing simpler! Your Uber is at your doorstep anytime, anywhere. Just a few taps, and you’re ready to go. Let us know where you’re going, and we’ll get you there. Choose a vehicle from a list of options available and tap “Request”. 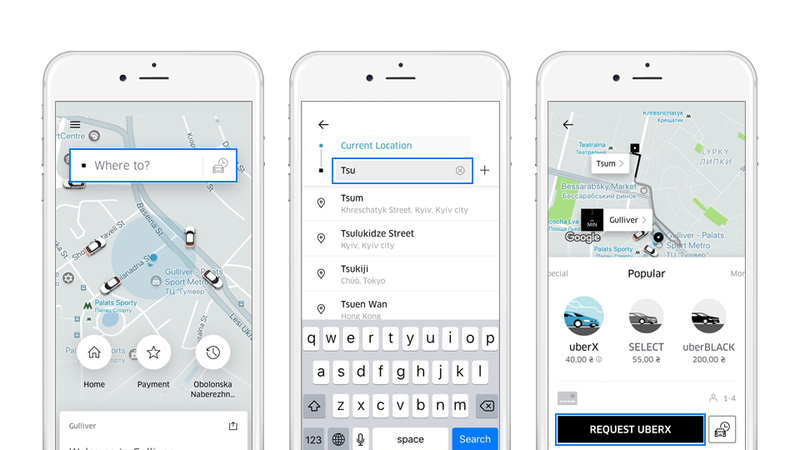 When you complete these steps, the app will start requesting your ride and connect you with the closest Uber partner driver. Once the driver accepts your request, you will be able to see the driver’s name, car model and other details. When driver arrives at your pickup location, you’ll see the car right on the pickup point you just pinned. We’ll notify you as your car is arriving. You can also track your driver on the map. Easy, right? Come on, try riding with Uber, sit back and enjoy your trip! Can I contact my driver if I want to specify my pickup location details? Sure! To contact your partner driver, press the bar with the driver information and then the “Contact” button. You can choose from “Chat” or “Call” options. The application uses phone number anonymisation system to make sure your personal data and your driver’s personal data is protected. Can I cancel a ride after request confirmation? Yes. But if you cancel the request 2 or more minutes after your driver accepted your request, you may be charged a cancellation fee. Drivers are also able to cancel ride requests. In this case, you may be charged a cancellation fee if your driver has been waiting for 5 or more minutes at your pickup location. Can I change trip details after the trip started? We recommend to add all your destinations before ordering a car, but if you have multiple stops or need to change your destination mid-trip, don’t worry! When this happens, the final fare to be charged will differ from the upfront fare quoted at the start of the trip. Can I request two Ubers at once? No. From your rider account, you may request one Uber vehicle at a time. You can request another vehicle immediately after your current trip ends. I have a promo code that offers a discount or free ride with Uber. How can I apply it? Learn how to add promo code in our blog. Still have question? Contact us at help.uber.com or using the help section of your app.